Harry is a Diagnostic Radiography Lecturer in the Department of Allied Health Sciences, School of Health and Social Care. He specialises in musculoskeletal radiographic reporting with interests in paediatrics and trauma. Harry spent nearly 10 years working with the Radiology Department at St Georges University Hospital NHS Foundation Trust, a London major trauma centre, before returning to LSBU in 2017, where he had originally studied his undergraduate radiographic and postgraduate reporting qualifications. 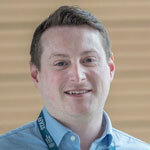 Harry has been involved in teaching student radiographers since qualifying himself in 2009. As a practice educator he supervised students clinically and as a specialist paediatric radiographer has taught on the LSBU undergraduate programme since 2012.